Witness the grace and grandeur of a 400 year old Japanese tradition, performed for the first time ever in South East Asia. BUNRAKU- Traditional Japanese Puppet Theatre is a showcase of fastidious teamwork as three puppeteers per puppet work in perfect unity with live traditional music and vocals. Led by upcoming Living National Treasure of Japan, Kanjuro Kiritake III, and featuring puppets which are intricately maintained historic artifacts, the show is presented in three parts: An interpretation of a harvest celebration dance, an excerpt of the classic "Fox in the Inner Garden", and a behind-the-scenes demonstration. Discount tickets and Premium tickets are also available. 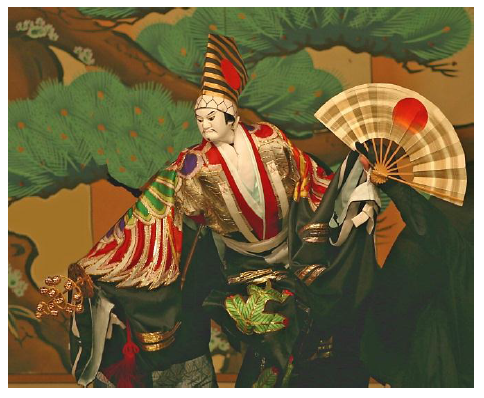 Ranking with Noh and Kabuki as one of Japan’s foremost stage arts, the Ningyo Johruri Bunraku puppet theatre is a blend of sung narrative, instrumental accompaniment and puppet drama. This theatrical form emerged during the early Edo period (ca. 1600) when puppetry was coupled with Johruri, a popular fifteenth-century narrative genre. The plots related in this new form of puppet theatre derived from two principal sources: historical plays set in feudal times (Jidaimono) and contemporary dramas exploring the conflict between affairs of the heart and social obligation (Sewamono). Ningyo Johruri had adopted its characteristic staging style by the mid eighteenth century. Three puppeteers, visible to the audience, manipulate large articulated puppets on the stage behind a waist high screen. From a projecting elevated platform (yuka), the narrator (tayu) recounts the action while a musician provides musical accompaniment on the three-stringed spike lute (shamisen). The tayu plays all the characters, both male and female, and uses different voices and intonations to suit each role and situation. Although the tayu “reads” from a scripted text, there is ample room for improvisation. Approximately 160 works out of the 700 plays written during the Edo period have remained in today’s repertory. Nowadays, it attracts numerous young performers, and the aesthetic qualities and dramatic content of the plays continue to appeal to modern audiences. http://www.ilassotickets.com or call / in-person at klpac Box Office: 03 4047 9000. * Concession tickets must be purchased at the Box Office with relevant ID. * Credit card is needed for Phone Reservation. KITSUNE Floor Seats RM 30 * only available for 29th show. 4) "Subscribe" to my newsletter!